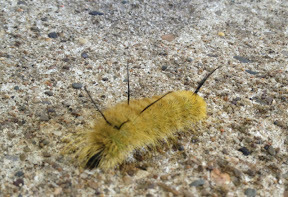 I saw this weird creature crawling on the patio this afternoon. It is creepy huh?!? I know it has to be scary when the dogs won't even mess with it. Usually Lily barks and paws at caterpillars, worms and crickets, but she wouldn't even touch this stinker! I've definitely seen some weird bugs here in Ohio that I never saw in Texas! Hayden came home from school before it slithered away. He said very matter of factly, "It is a horned caterpillar, mom. I saw one at school today. I wouldn't recommend touching it."